How to play Sunday Million, Sunday Storm and The Big Bang? I think all online poker players have longed to win one of these tournaments. With my little experience I still find it almost impossible to win one of these. Has anyone here from the CC been well ranked in such a big tournament? What was the strategy? Similar Threads for: How to play Sunday Million, Sunday Storm and The Big Bang? big bang is easy to get a good position. I've personally gone out at 132nd out of about 5000 or more players. Sunday storm is hard but Sunday million is a lot harder. Strat for big bang is play aggresive only if you know how to. You need to double up your chip stack and you should be able to get into the money. Sunday million strat is survive. I knew a guy who made it to the final table of the Sunday Million. I know that he was a good player, worked hard at it, and that the game ran over a couple of days. They actually take a sleep break at some point. Good luck! re: Poker & How to play Sunday Million, Sunday Storm and The Big Bang? sunday million is (the tourney) every player wish win one day,it´s like a dream of mine,but I have to work hard to get even a good position. Strat for big bang is play aggresive only if you know how to. I liked it. Now to find out how. I played several times the Big Bang, but unfortunately, I didn't win. As you were saying "good poker". I play micro and low mostly and sometimes medium stakes. Everytime I get put out its coz some micro player has shoved with 22,33, K9o 56s or something like that and they hit. And the only reason I call is coz I see them shoving all the time so I will call with a premium hand and they will hit. Not all the time but alot of the time. It's not as common at medium stakes. My question is do u get players like that at high stakes who shove all the time or wI'll just call you down with small pairs or ace high?. I do cash alot and have had my best results at low and medium MTT. If you are thinking about giving it a try, Sunday Feb 4 is the day to do it. 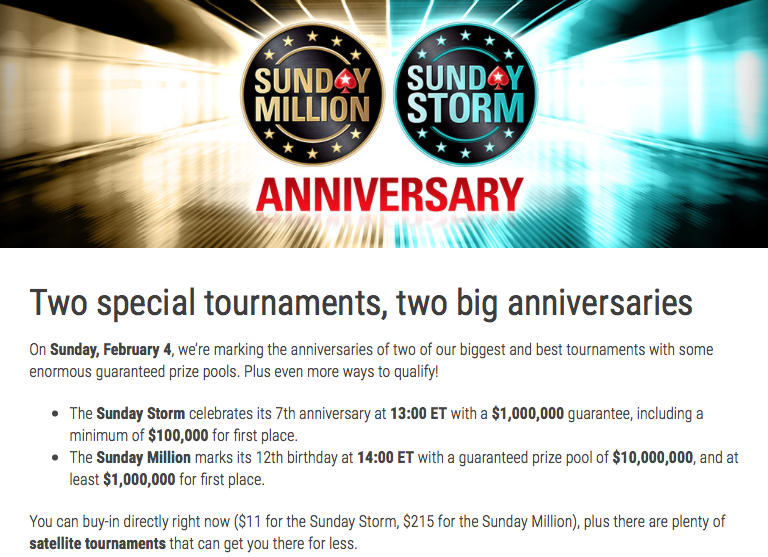 The Sunday Storm guaranteed prize pool is being quadrupled and the Sunday Million will be 10X. I've never payed one, but am seriously considering the Storm for that day.